A fairly recent grand addition to Warsaw's portfolio of museums. Years in the making it opened in 2013/14 with great fanfare – and it soon won prestigious awards. Yet I wasn't altogether convinced (explained below), from a general point of view and of the exhibition design overall. For the dark tourist, however, the Holocaust section, as well as the post-war, communist-era section are topically quite relevant, of course. The rest can be skimmed or skipped. More background info: The first proposals for setting up a museum like this go back to 1995. 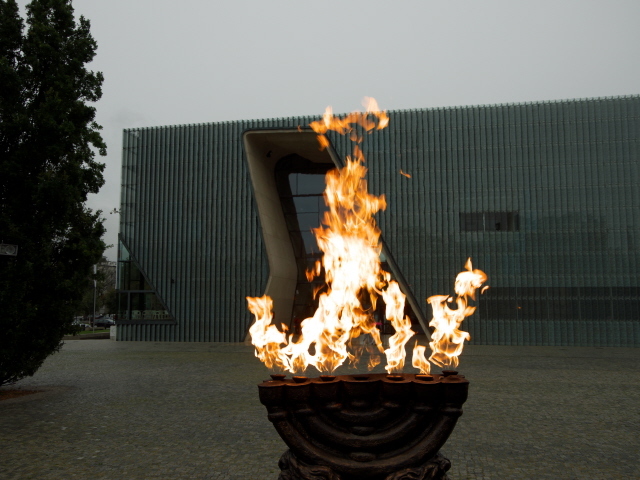 As an actual project, the museum was founded back in 2005 by the Association of the Jewish Historical Institute of Poland together with authorities of Poland and the City of Warsaw, as a public-private institution. The museum's location right in the heart of what was the Warsaw Ghetto (see Ghetto Trail) made it a sensitive issue. But a large international team pulled it together in a relatively short time. When I was first in Warsaw, back in 2008, there was only a small pavilion with plans, drawings and photos outlining the future design of the museum to come. Yet that same year it already won its first award (Chicago Athenaeum International Architecture Award), i.e. before it was even built! The building was finished in 2013 and already opened to the public in April that year, even though it took another year and a half for the Core Exhibition to be finished and also open, on 28 October 2014. In 2016 the museum won the prestigious European Museum of the Year Award by the Council of Europe. It is certainly now THE focal point in Warsaw with regard not only to Jewish studies in general, but also especially with regard to the dark history of Warsaw in WWII and the fate of its ghetto. What there is to see: The first and largest feature of the museum is the distinctive design of the building itself, so it's worth taking that in for a while before heading inside. Once through the door, the next pre-visit obstacle is the tough security check that we've come to expect from all museums related to anything Jewish. So it's airport-like metal detectors, emptying pockets, and all that before you can finally enter the main exhibition, called the Core Exhibition here. This already implies there are other elements too, including temporary exhibitions (which require separate/additional tickets) as well as a resource centre, an auditorium, conference rooms, a large shop and a restaurant. I only went to see the Core Exhibition, so the following outline will concentrate on that alone. The museum promises a “journey through 1000 years” of Polish Jewish history, so predictably it kicks off with some really old bits, starting in the Middle Ages. I openly admit that history that old somehow fails to fascinate me sufficiently, so I just skimmed through these early sections and actually skipped virtually all of the informational elements here (be in text or audiovisual format). The impression I did get, however, was that of an extremely visual approach. There are plenty of things that are fantastic to look at, such as the reconstruction of a synagogue's interior, but other elements are also somewhat “crude”, and surprisingly simplistic – such as the cartoon-like figures of people, semi-animated in wall projections. But these are animated only in so far as the whole cut-out shapes of these figures move, but they're not actually full animations (i.e. with lips moving and gestures or such like … it's more like those animations in Monty Python's Flying Circus .. minus the wacky humour, of course). Obviously there are lots of religious objects and works of art on display, and there are also plenty of interactive touchscreens and video projections. Everything is bilingual, in Polish and English. The sections where my interest started to get stirred a bit more were those entering the modern age, such as that of industrialization. There is one part about the textile industry that flourished in the 19th century (and beyond) especially in Lodz. Having just visited that city, I recognized many of the images of the grand brick factories and names of their Jewish owners. 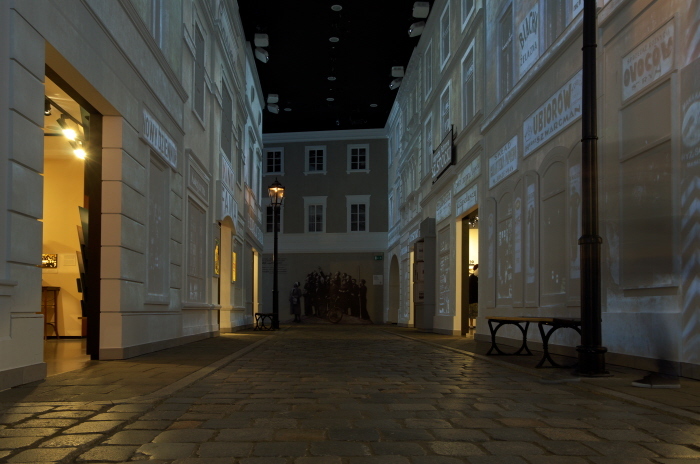 Visually the most awesome bit, though, is the reconstructed “Jewish Street” … at least until you (quickly) realize that what looks like real ornate facades and shop signs are actually just clever projections onto white walls. The lampposts and cobblestones on the floor are real, though. A particularly richly illustrated part of this section is, as you would expect, about the Warsaw Ghetto. This is followed by the onset of the worst phase of the Holocaust from 1942, with mass “deportations” (in Warsaw especially from the so-called Umschlagplatz) and eventual “liquidation” of the ghetto. More generally, the exhibition also provides extensive information and grim illustration of the mass extermination of Jews, first at the hands of the “Einsatzgruppen”, with mass shootings at sites such as Ponary in what is today Vilnius, Lithuania, and eventually, following the Wannsee Conference, in the industrialized mass murder of Jews in the “Final Solution” (i.e. in the gas chambers of the death camps). The last section of the exhibition is the one I found the most illuminating: it's about the post-war story of the surviving mere ca. 300,000 Polish Jews (and this is something that I had not been so familiar with, in contrast to the history of the Holocaust). While many went to Palestine (initially often illegally) and played a key part in the founding of the state of Israel, others stayed in Poland and tried to rebuild a life from the rubble and trauma. However, especially in the late 1960s, Polish Jews once again faced a wave of anti-Semitism, hostile propaganda and repression. Many were forced to leave (again mostly to Israel). This section also touches on the controversies surrounding the preservation and commodification of the sites of the Holocaust, including the fact that during the communist era it was routinely left unmentioned that the vast majority of the victims at these sites were indeed Jews (the same applied all over the Soviet sphere of influence). One especially problematic issue was also that of a Christian convent that was established right on the edge of Auschwitz in the 1980s. After the outrage this caused it was eventually moved elsewhere (by papal decree). The late 1980s saw more changes for the Jewish community in Poland and especially its heightened recognition – also helped through the political changes brought about by the Solidarnosc movement (cf. Roads to Freedom, Gdansk) that led to the fall of communism, first in Poland itself, then all over the Eastern Bloc. All this is amply illustrated and narrated and I found myself spending more time in this final section of the museum than I had spent in all the previous sections put together. So all in all I felt it was a very rewarding visit, even though the initial parts of the exhibition and some aspects of its design had left me rather cold to begin with. But this was well compensated for in the last two or three sections. 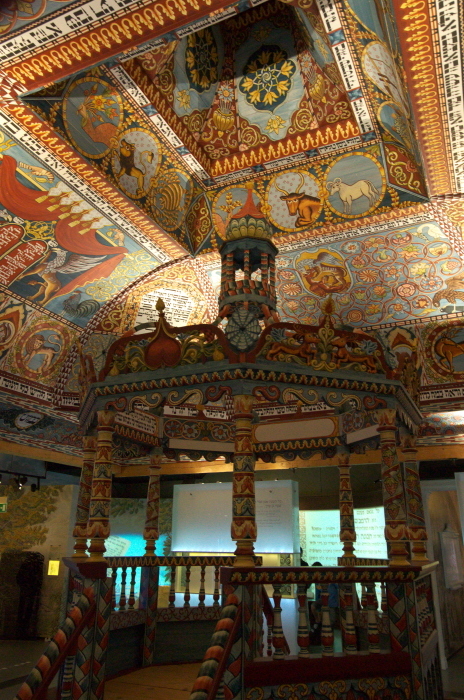 The POLIN Museum can best be compared to the Jewish Museum in Berlin. There are several similarities in design, their stories of inception and the missions both museums adopt. Note that neither are Holocaust museums as such (this is often erroneously assumed by some), though both have sections on that darkest of subjects. In comparison the Warsaw museum covers this in more detail and explicitness, whereas the equivalent institution in Berlin chooses a more abstract approach overall. Both museums have excellent sections on the post-war developments and social issues, though they obviously cover very different things pertaining to the respective countries in question and so can't really be compared in content. However, both museums devote the majority of exhibition space to aspects of older Jewish history, Jewish culture, art and religious questions – and these will naturally be of less interest to decidedly dark tourists (but of great interest to Jewish Heritage tourists). The presentation of these aspects is somewhat more convincing in Berlin, and in terms of architecture, Berlin's Jewish Museum's extravagantly modernist design by Daniel Libeskind can hardly be beaten so easily anyway. Impressive as it may be in its own right, the POLIN museum's architectural design necessarily falls way behind its Berlin counterpart. But that's only a purely aesthetic judgement which is of little importance for the overall evaluation of the merits of the two museums as such and their contents. Location: in the heart of what used to be Jewish Warsaw, in the northern half of the city centre, about a mile (1.5 km) west of the Old Town. Right on the square with the Ghetto Uprising Monument (see Ghetto Trail), between the streets Zamenhofa, Anielewicza, Karmelicka and Lewartowskiego. Access and costs: a little bit off the beaten mainstream tourist track, but not difficult to find; a bit pricier than many other museums in Poland, but still reasonable. If, however, you want to use public transport for getting there you can do that too. Bus lines 111 and 180 bring you the closest to the museum (it has its own dedicated stop “Nalewki Muzeum”). The nearest tram stops are on either Andersa (e.g. lines 4, 15, 35, stop Muranow) to the east or on aleja Jana Pawla II (lines 17, 33, 37, 41, stop Anielewicza). From there walk up the street Anielewicza either westwards or eastwards, respectively. Getting there by car is not recommended (except perhaps at weekends, when a few parking spaces are made available by the museum on-site). Admission tickets are now sold inside the museum (previously it was from windows on the outside, namely on the southern side of the building; but this has now changed as I have been informed. Why this change I have no idea). Admission: regular tickets for the Core Exhibition cost 25 PLN (some concessions apply, there are also reduced group tariffs). Admission to the temporary exhibition on its own is 12 PLN. Combination tickets for both this and the Core Exhibition come to 30 PLN. You can pre-purchase all types of tickets online from the museum's website (polin.pl). Hiring an audio-guide costs an additional 10 PLN. They are available in various languages, including English, French, German, Hebrew, Yiddish, Hungarian, Russian, Italian and Spanish. Guided tours of the Core Exhibition with a live guide are also available and cost 35 PLN; tours in English are available on Saturdays and Sundays at 3 p.m. Opening times: Monday, Thursday, Friday from 10 a.m. to 6 p.m., Wednesday, Saturday and Sunday open late till 8 p.m., closed on Tuesdays (which is unusual – normally Jewish museums remain closed for the Sabbath, Fridays/Saturdays from dusk to dusk, but not here, for some unexplained reason). NOTE: last admission is a full two hours before closing! Also note that you may have to allow a little additional time for the usual security checks at the entrance. Time required: the “official” estimate seems to be two hours (given last admission times – see above), but those especially interested in the final couple of sections alone could probably do with less than that. Those, on the other hand, who want to get to the bottom of everything the museum offers could probably spend much longer in here. Combinations with other dark destinations: Most obviously: the Ghetto Trail that the museum sits at the very heart of. But also the Jewish cemetery, Korczak orphanage and the Pawiak prison. For yet more see under Warsaw in general. Combinations with non-dark destinations: The area of the former ghetto is today one of the most drab and uninspiring, architecturally and in terms of its atmosphere, so there's little reason to roam around here other than for the ghetto history bits. But the “nice” parts (in the mainstream tourism sense) of the city aren't too far away. The Old Town core, for instance, is only about a mile (1.5 km) away, so within walking distance.